Markdown (default) and / or BBCode post formatting, with onebox and <spoiler> / [spoiler] tag support. Thredded works with SQLite, MySQL (v5.6.4+), and PostgreSQL. Thredded has no infrastructure dependencies other than the database and, if configured in the parent application, the ActiveJob backend dependency such as Redis. Currently only MRI Ruby 2.2+ is supported. We would love to support JRuby and Rubinius as well. If you're looking for variations on a theme - see Discourse. However, It is a full rails application and not an engine like Thredded. Testing with all the databases and Rails versions locally. Thredded provides an app generator that will generate a Rails app with Thredded, Devise, SimpleForm, RSpec, PostgreSQL, and a basic theme and navigation that is configured to work out of the box. See thredded_create_app --help and the thredded_create_app repo to learn about the various options. Then, see the rest of this Readme for more information about using and customizing Thredded. Add the Thredded initializer to your parent app by running the install generator. Copy emoji images to your public/emoji directory. Thredded needs to know the base application User model name and certain columns on it. Configure these in the initializer installed with the command above. But then compare this with the previous version to decide what to keep. Are you currently using Forem? Thredded provides a migration to copy all of your existing data from Forem over to Thredded. By default, thredded renders in its own (standalone) layout. When using the standalone thredded layout, the log in / sign out links will be rendered in the navigation. For these links (and only for these links), Thredded makes the assumption that you are using devise as your auth library. If you are using something different you need to override the partial at app/views/thredded/shared/nav/_standalone.html.erb and use the appropriate log in / sign out path URL helpers. mkdir -p app/views/thredded/shared/nav && cp "$(bundle show thredded)/$_/_standalone.html.erb" "$_"
You can also use Thredded with your application (or other) layout by by setting Thredded.layout in the initializer. In your layout you will probably have links to other paths in your app (e.g. navigation links). For any url helpers (like users_path or projects_path or whatever) will need to have main_app. prefixed to them so that they can be found from thredded (main_app.users_path will work from both thredded and your app). // The padding and max-width are handled by the app's container. See below for customizing the styles via Sass variables. Thredded is fully compatible with deferred and async script loading. Thredded views also provide two content_tags available to yield - :thredded_page_title and :thredded_page_id. The views within Thredded pass those up through to your layout if you would like to use them. The user above is the user whose posts are rendered, and current_user is the user viewing the posts or nil. The policy scopes that limit the posts to the ones current_user can see are applied automatically. The code above uses the ApplicationController.render method introduced in Rails 5. If you're using Rails 4, you will need to add the backport_new_renderer gem to use it. mkdir -p app/views/thredded/posts && cp "$(bundle show thredded)/$_/_post.html.erb" "$_"
NB: Overriding the views like this means that on every update of the thredded gem you have to check that your customizations are still compatible with the new version of thredded. This is difficult and error-prone. Whenever possible, use the styles and i18n to customize Thredded to your needs. Thredded provides view hooks to customize the UI before/after/replacing individual components. # This is render in the Thredded view context, so all Thredded helpers and URLs are accessible here directly. You can use the post content textarea hook to add things like wysiwyg/wymean editors, buttons, help links, help copy, further customization for the textarea, etc. grep view_hooks -R --include '*.html.erb' "$(bundle show thredded)"
Thredded comes with a light Sass theme controlled by a handful of variables that can be found here: https://github.com/thredded/thredded/blob/master/app/assets/stylesheets/thredded/base/_variables.scss. If you are writing a Thredded plugin, import the thredded/base Sass package instead. The base package only defines variables, mixins, and %-placeholders, so it can be imported safely without producing any duplicate CSS. Thredded sends several notification emails to the users. You can override in the same way as the views. See this page on how to style the emails. If you use Rails Email Preview, you can include Thredded emails into the list of previews by adding Thredded::BaseMailerPreview.preview_classes to the Rails Email Preview preview_classes config option. You can also turn off the email notifier totally, or add other notifiers (e.g. Pushover, possibly Slack) by adjusting the Thredded.notifiers configuration in your initializer. See the default initializer for examples. Thredded is mostly internationalized. It is currently available in English, Brazilian Portuguese, Chinese (Simplified), German, Polish, Italian, Russian, French, and Spanish. We welcome PRs adding support for new languages. Add rails-i18n and kaminari-i18n to your Gemfile. Note that it is important that timeago and its locales are required before //= require thredded. To generate URL slugs for messageboards, categories, and topics with support for more language than English, you can use a gem like babosa. Add babosa to your Gemfile and uncomment the Thredded.slugifier proc for babosa in the initializer. Thredded comes with a flexible permissions system that can be configured per messageboard/user. It calls a handful of methods on the application User model to determine permissions for logged in users, and calls the same methods on Thredded:NullUser to determine permissions for non-logged in users. The methods used by Thredded for determining the permissions are described below. To customize permissions for logged in users, override any of the methods below on your User model. To customize permissions for non-logged in users, override these methods on Thredded::NullUser. 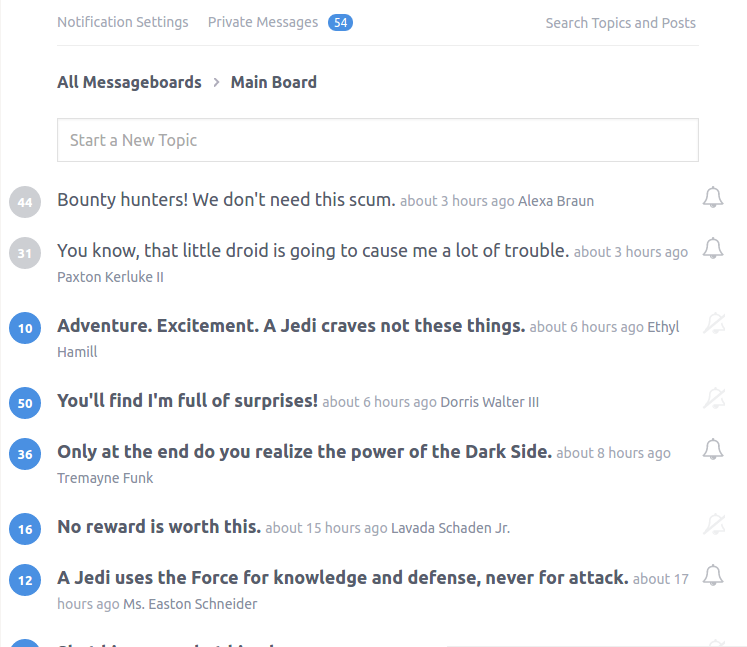 A list of messageboards that a given user can post in. Thredded defines a number of Exception classes for not found / permission denied errors. The complete list can be found here. Currently, the default behaviour is to render an error message with an appropriate response code within the Thredded layout. You may want to override the handling for Thredded::Errors::LoginRequired to render a login form instead. For an example of how to do this, see the initializer. 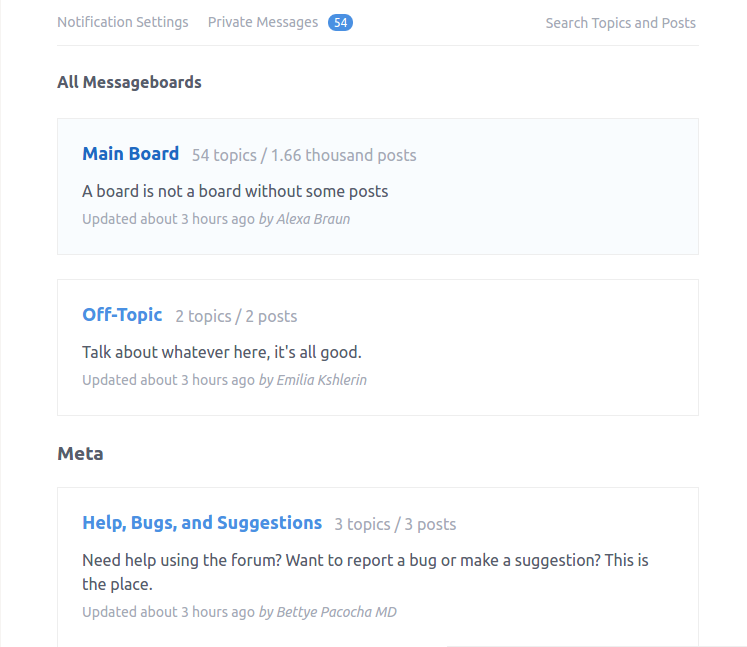 Reactive moderation, where posts from first-time users are published immediately but enter the moderation queue (default). Pre-emptive moderation, where posts from first-time users are not published until they have been approved. This is controlled by the Thredded.content_visible_while_pending_moderation setting. Users, topics, and posts can be in one of three moderation states: pending_moderation, approved, and blocked. By default, new users are pending_moderation, and new posts and topics inherit their default moderation_state from the user's. When you approve a new user's post, all of their later posts will be approved automatically. Additionally, users always see their own posts regardless of the moderation state. For blocked users, this means they might not realize they have been blocked right away. Blocked users cannot send private messages. BBCode formatting for posts, e.g. [b]for bold[/b]. Can be used alongside Markdown. Code Syntax Highlighting in Markdown using Coderay. TeX math via KaTeX in Markdown, fast, accessible, JS-free math rendering. Thredded is built for extensibility, and writing plugins for it is easy. If you plan on extending Thredded functionality in a way others may benefit from, please consider making it a plugin. To be more clear - this is the for when you are working on this gem. Not for when you are implementing it into your Rails app. To run the tests, just run rspec. The test suite will re-create the test database on every run, so there is no need to run tasks that maintain the test database. By default, SQLite is used in development and test. On Travis, the tests will run using SQLite, PostgreSQL, MySQL, and all the supported Rails versions. Thredded Ruby code formatting is ensured by Rubocop. Run rubocop -a to ensure a consistent code style across the codebase. Thredded is documented with YARD and you can use the inch gem or the Inch CI to find code that lacks documentation. Additionally, all the thredded views must be wrapped in a <%= thredded_page do %> block. On Turbolinks 5 onPageLoad will run on the same DOM when the page is restored from history (because Turbolinks 5 caches a clone of the body node, so the events are lost). You can also test the gem with all the supported databases and Rails versions locally. The above will build and run everything, daemonized, resulting in a running instance on port 9292. Running docker-compose logs will let you know when everything is up and running. Editing the source on your host machine will be reflected in the running docker'ized application. Note that when using boot2docker on a Mac make sure you visit the boot2docker host ip at http://$(boot2docker ip):9292. The docker container uses PostgreSQL. Generated on Wed Apr 17 14:24:48 2019 by yard 0.9.19 (ruby-2.5.1).